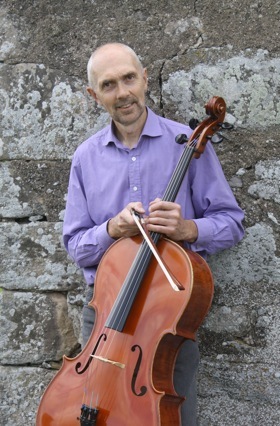 Geoff Palmer has made several appearances in the Saturday Recital Series at St Andrew's Cathedral over the past two years, playing solo cello Suites by J S Bach (in C minor and Eb major), Britten's first solo Suite, Brahms' F major Sonata and David Wilde's moving solo lament The Cellist of Sarajevo. These and other performances mark a return to performing after a silence of several years, following an elbow injury in the early 1990s. During this decade-long gap, Palmer has pursued his other musical loves - composing and teaching. He continues to be active as a composer - his most recent work being the Fourth String Quartet, premiered in Canada in August, to be followed by a concerto for the Canadian flautist Robert Aitken for performance in Toronto in March 2010. His teaching is centred at the University of Aberdeen, where he teaches music history, composition and performance courses. Now able to play again, he is developing the range of his interests - ranging from contemporary improvisation to folk music, which he has recorded with Paul Cowlan on the Swiss Brambus label.